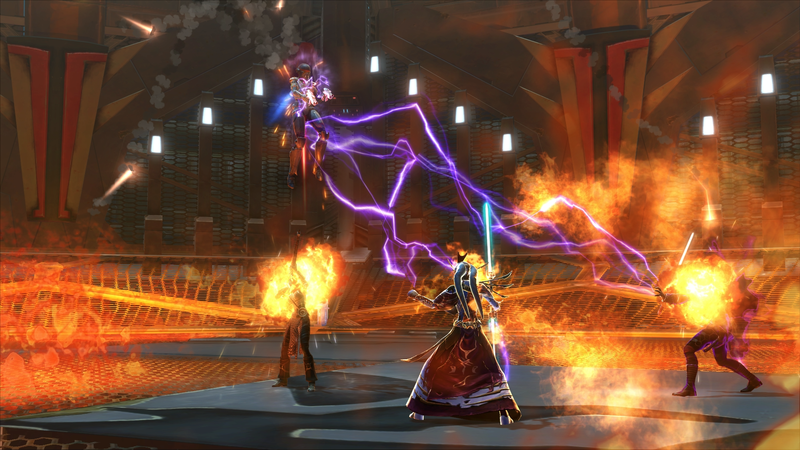 Shadow of Revan is shaping up to be quite the nostalgia trip. For players of the original Knights of the Old Republic single-player game, it re-introduces the protagonist of that beloved game. But for fans of Star Wars: The Old Republic, it also brings back something that’s been missing from the game for a while: story. While the last two expansions, Galactic Starfighter and Galactic Strongholds, have added lots of new mechanics, the game’s initial calling card – that polished BioWare story experience – has been notably lacking. That’s something the team is looking to correct with Shadow of Revan. “It’s something players have asked for since Rise of the Hutt Cartel,” said the General Manager of BioWare Austin, Jeff Hickman, during a press summit last week. 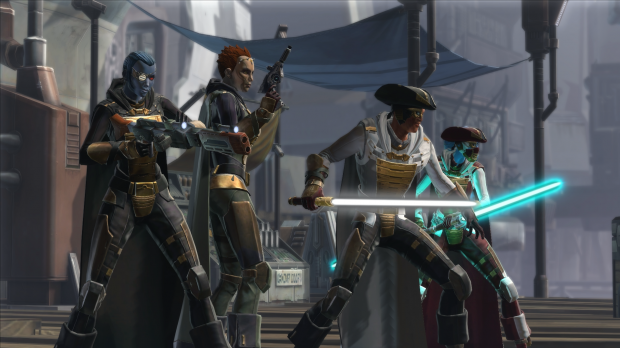 “The centerpiece is your role in Revan’s story,” added Senior Producer Bruce MacLean. Overall, the Revan story is something the team has been working on for nearly eight years, well before the launch of the game, and their giddiness at finally being able to reveal it stood out more prominently than Princess Leia’s hair buns. So what’s in the expansion? The Revan storyline obviously takes center stage, and the threat of the Sith lord and his followers, the Revanites, is something both the Republic and the Empire need to take seriously. As such, you’ll work alongside a descendant of Revan, Theron Shan, and a strangely cooperative Sith Lord, Lana Beniko, to confront him. If you’re familiar with the KOTOR storyline, Revan isn’t your simple “kill ’em all” Sith lord, and the team promised that he wouldn’t be your everyday villain. The cut scene we viewed of him seemed to play against that, with him giving the usual platitudes about wiping out his enemies, ruling the galaxy, and so on. (Yes, he speaks. And yes, the canonical Revan is a “he.”) I’m hopeful that what we saw was just a taste of what’s to come, and that the “real” Revan won’t be a cookie-cutter bad guy; he clearly deserves more. Your travels will take you to two new planets: the tropical pirate hideouts on Rishi and the habitable moon Yavin 4, home of the Massassi warlords and where other stuff would happen much later in the Star Wars saga. 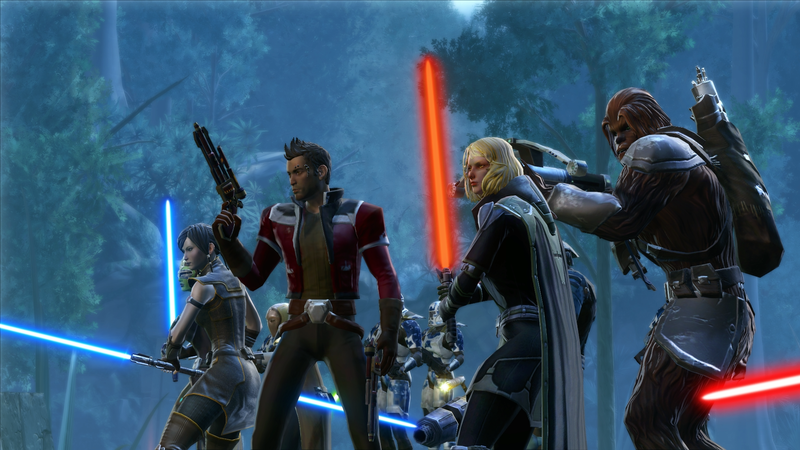 The level cap’s being raised from 55 to 60, as well, and as someone who still has the taste of SWTOR’s early grindy leveling in his mouth, I asked pointedly if there was a conscious effort being made to “maximize the fun while minimizing the filler.” The team is certainly aware of this complaint, and it was a major reason for the 12x leveling boost handed out to pre-purchasers of the expansion, so they could experience the story missions while skipping most of the other leveling content. I was told that that was something they had in mind this time around (and for the future), but I’ll want to see how it all plays out before making a final judgment. Other than leveling, what else will you find on those new planets? There are two new flashpoints: Blood Hunt and the Battle of Rishi, and an operation, the Temple of Sacrifice, where you’ll square off with Darth Revan himself in what MacLean calls “the toughest fight we have made.” There’s also no gear grind to prepare yourself for the operation. According to MacLean, you should be able to “jump right in” as soon as you hit 60. If you’re having trouble finding a group for the flashpoints, you’re in luck. Both are available to be played as a solo player, and you’ll get a combat droid to help you along, in addition to the companion of your choosing. I tried Blood Hunt this way on my commando and it was a solid experience. 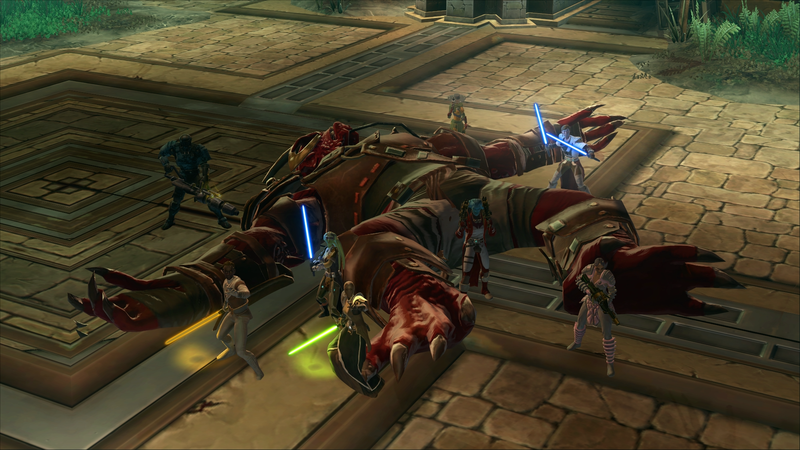 It felt like a longer story mission and it would make for a decent substitute if you can’t find a group and want to progress in the story or if you just want to fully treat SWTOR like a single-player game. 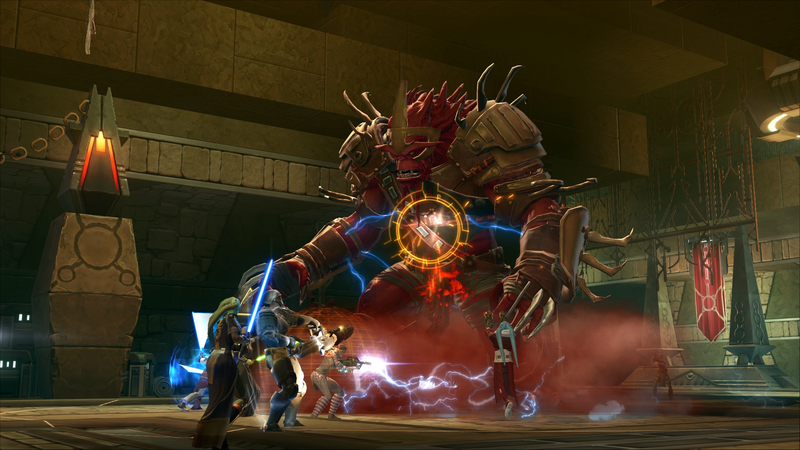 In addition to the two new flashpoints, four Forged Alliances flashpoints will also be converted to solo play. Is this the right direction for an MMO to go? I suppose SWTOR has to be even more “solo-friendly” than most MMOs, considering its roots, and the team needs to adapt the game for how people are playing it, not how they want them to play. They said that they “love data” and have tons of numbers they use to make their decisions – one good example was that only 1.4% of free players hit the cap on their weekly warzone limits – so if you don’t like the idea of the solo-ification of SWTOR, I guess you only have yourself (or other players) to blame. We were also introduced to the changes in the skill system, as represented by the disciplines. You can read about it in detail on the official site, so I won’t go into it in great detail here. While some might decry them as simplifying the game, as with the solo flashpoints, they’re a response to how people played the game, not how they said they played or how they liked to play. There were only a few valid builds to be had for each class, and a lot of infrequently used powers that just took up space, so a general streamlining made sense. Picking my utility powers – which were all passive – for a level 60 character was a little intimidating, but I imagine it would be much easier if you were doing it as you leveled up. As someone who used to play a trooper, I felt about halfway skilled with my character, and any awkwardness was due to my re-learning things rather than any complexities introduced by the discipline system. In short, if you’re used to playing your character a certain way, this system won’t likely disrupt your play style to any great degree. You might have slightly fewer options, as some of your powers are considered “core” to another discipline, but your overall role – tank, healer, or DPS – should work pretty much the same. We later broke up into a roundtable with the devs, where a lot of really granular questions about gear, quality of life features, and what could and couldn’t be done with the game in the future were asked. Most of it was over my head, but a few lines that stood out were “We have a love/hate relationship with our engine” and how they “didn’t have ideal dev tools in a lot of areas” during the game’s early days and had to create their own automated testing tools to balance classes. They realize there will be imbalances, but they’re reasonably happy that characters are all within about 5% of each other now in terms of straight-up power. As a semi-casual player who hadn’t touched SWTOR in over two years, my general impression of the expansion content was “more of the same,” but that’s not necessarily a bad thing. 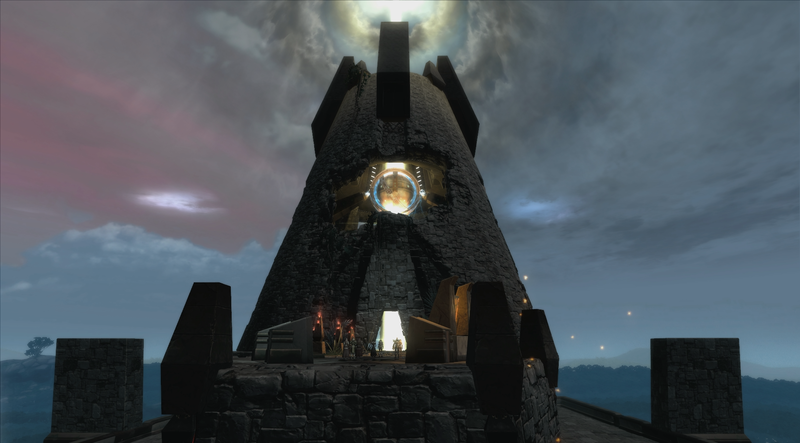 The story was touted as the primary attraction of the game at launch, what set it apart from the rest of the MMO crowd. If Shadow of Revan can deliver another quality story, while avoiding the repetitive action of previous content, that would be great. Jaw-dropping innovation isn’t the thrust of this expansion – delivering a quality experience with the tools they’ve made available over the last three years is. The expansion is almost a microcosm of the attitudes toward the game at launch. People expecting a completely new and transcendental MMO experience were maybe a little disappointed that SWTOR wasn’t “different” enough. If you were one of those people, Shadow of Revan won’t do much for you. If you’re like me, though, and you took a break after completing your class’s storyline and wanted more – but didn’t feel like going through it all again on an alt – this might be a good time to jump in. The 12x XP bonus is still in effect until the seven-day early access period begins on Dec. 2, with the main launch happening on Dec. 9. And if you’re an old-time KOTOR player who never gave SWTOR a try but want to know what happened to Revan, here’s your chance. BioWare promises that this will definitively close the chapter on the iconic character – “until you need him again,” I jokingly suggested. We all got a good laugh from that one, but I think they were serious about ending the Revan story arc. I was under the impression that the biggest draw to MMOs is interacting with other people. I dunno, am I crazy? I have to agree with everyone else. The F2P restrictions (And even Preferred Access) are severely restricted. Some restrictions I don’t partially mind like higher costs (in credits) to do Augment Slots or Respec, but some things like the Credit Cap are just frustrating. At some point it becomes lest frustrating just paying $15 instead of sinking money into unlocks and escrow purchases. The two restrictions that absolutely piss me off are the Guild and Medical Probes. I created a Guild with the 3 friends playing with me to get the EXP Boost (Like 1% or something), I let my subscription lapse and they automatically removed Guild Leader without even asking if I wanted to keep it and convert the guild to F2P. Funny thing is it granted it to another Preferred User that didn’t login yet. It’s just going to go around until it converts the guild into to F2P or someone inactive gets it. If you’re playing in a party Medical Probes don’t get too annoying, but soloing turns it into a running simulator every time you die. Would be amazing to contact SWTOR Support (In Game) about grants that didn’t go through when you were a subscriber … at least they have a EMail that’s never listed officially anywhere on their website…right? Agree with comments above, the F2P model compared to Rift etc is really bad.Game have many good things for it with great endgame and plenty to do.Anyways what they say about F2P not doing WZ is utter nonsence ! Many of them group with subscribers to bypass the 5 match limit a week for F2P and second. MOST F2P players don’t que up for that exact reason the limit on WZ a week.But as a mainly PvP player i feel the pain on things like no gear check for Ranked.Pretty big slap in the face of PvP players.You get more people playing PvP if the game is promoted by the players as great and skillful and fun.When badly geared players can que up and destroy it for the rest it gives out a signal nothing to see here move on.BioWare just dont have a clue when it comes to PvP,shame really. As a Star wars fan and someone that has spent many hours in Kotor and Kotor 2 It saddens me that SWTOR is still so badly Restricted for F2P, I did sub for a bit last year but I don’t have much time these days so a Sub is just not a viable thing for me now and the difference between a Sub experience to the F2P is mind blowing and not in a good way, I would love to see how the Revan story continues on but not this way. Yea I agree, They crippled F2P pretty bad, The big turn off for me was you could only do a few flashpoints a week unless they changed it, I also think they had gear restrictions as well. I would gladly pay for the expansions, But the F2P turned me off so bad to the game. Remove the F2P restrictions on players going from 1-50. Only charge for the expansions. Keep the Cartel Market for just cosmetics. Vanity Titles. This would draw alot more people in. Oh maybe exp potions in the Cartel Market, But that’s it. If they had a F2P model comparable to Rift, Tera, Aion, then just charge for the expansions, This games player base would triple.